But it also has another important characteristic, Japan is a very robotized country. Japan has very intrinsically accepted within its culture the robot. And not only in working life, but also in personal life. The affinity that Japan has for robotics has to do in part with Shinto beliefs, Buddhist teachings that relate the interconnection between the animate and the inanimate and traditional crafts such as karakuri ningyo (automata). Japanese life is very tied as we all know technology. Hence the image of a country that loves technology. Due to the scarcity of natural resources, what Japan has done is to convert imported raw materials into cutting-edge technology. For later export. Japan is currently the leading country in manufacturing and consumption of robots, in the world there are around 4,500 robotic engineers and half of these are Japanese. The robots have been developed in Japan for certain purposes; for the construction of products, for entertainment, for provisioning to companies, for the provision of useful services. Sony, Honda and MEC have been the main companies that have developed innovation and research projects in the area of ​​robotics. We also highlight the work of certain universities such as the University of Waseba in this area. Today Japan faces serious problems such as: a declining birth rate, a population that is aging, environmental and energy problems. Japan sets its sights on robots and works to create a society with a higher quality of life. At first the robots that we found in Japan, were robots with a little mechanical movements that went up and down stairs, they greeted, they moved, they spoke with some difficulty. Today the robots we see in Japan, China, South Korea are much more sophisticated. 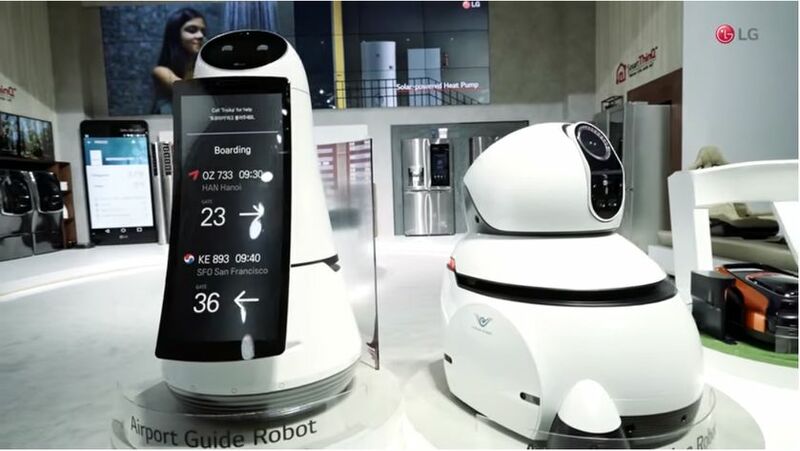 We see LG Robots at the Inchaon International Airport in Seoul helping users to locate and find their destinations more easily. As with East Japan Railways. The robots will find them soon also in the Japanese train stations with similar informative functions. We also find them in cafeterias. Robots waiters. Robots who take your order and bring you food. Robots from Pangolin Group for example. Chinese manufacturer leader in service robots for the hotel industry. In addition to Japan, China and South Korea, countries such as the United States are also beginning to join the robot boom. Where we started to see restaurants where only robots work without any human supervision. For example, the restaurant / cafeteria Eatsa, which already has seven subsidiaries: three in California, two in New York and two in Washington DC. We also see the new robots made by start-up companies. Like Momentum Machines, a US start-up of fast food that has created a robot that can make up to 400 hamburgers an hour. What is better to try to match this innovation in robotics to our daily life as Japan does or to go behind? But what is better? Go adapting the robots to our daily life as is being done in countries where robot culture and artificial intelligence we see that it is more accepted as in Japan, China and South Korea or stay still and wait for an explosion of superintelligence or Advanced robots suddenly arrive in a couple of decades leaving us with their mouths open and not knowing how to interact with them? Tokyo is known as a source of all trends in fashion. You can see walking through its pedestrian streets full of shops thousands of people with different exclusive outfits, personalized and often made by themselves. In Tokyo is where Zara from Inditex is always catching new trends for their next seasons. And not only in Europe and the US, but also for the entire planet. As they say, “innovate”, being the first is to lead. Let’s innovate then, let’s lead then. Let’s accept the robots in our lives ! !